A while back, I was contacted by Planetary Geologist Dr. Simon Kattenhorn, a leading expert on one of Jupiter's moons, Europa. His research (along with the research of Louise Prockter) indicates the existence of icy plate tectonics and subduction on Europa. 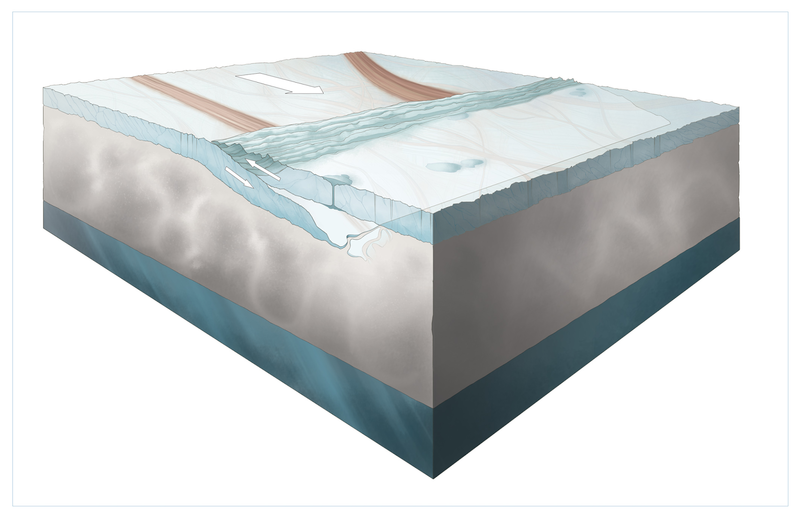 Photos of Europa's surface showed the icy crust that covers the moon's surface was expanding, but scientists had been unable to explain exactly how this process was taking place until recently. Kattenhorn and Prockter's research seems to show that plate tectonics and subduction (where one plate is forced under another) is the key to understanding some of the geologic mechanics of the icy moon. If true, this would be the first evidence of this kind of activity anywhere other than Earth. Pretty cool, right? Dr. Kattenhorn asked if I would be interested in illustrating this subduction process for his research paper. As technical and scientific illustration is one of my favorite kinds of work, I accepted immediately. Not only do I genuinely love this type of illustration, having the opportunity to contribute to a discovery of this magnitude (geology pun) was truly an honor. 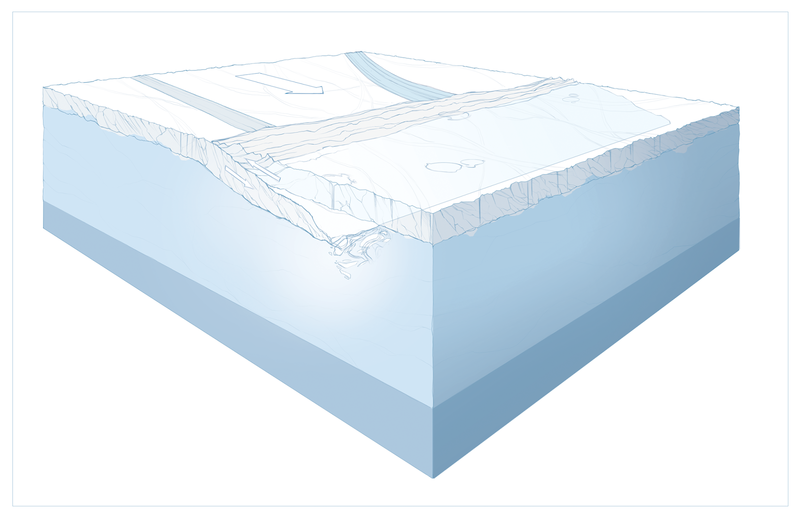 The illustration shows the hard, brittle ice that covers the surface. This is where massive ice plates move around like the plates on Earth. Sometimes they collide, forming large ridges and mountain ranges of ice. When one plate is forced beneath another plate, part of that plate can be subsumed into the layer of warmer ice beneath it. Beneath the second layer of ice is liquid ocean. You can't tell me that's not awesome. Part of the fun of illustration for me is getting to imagine what these environments are like while I'm drawing them. Picturing the almost unfathomable depths of ice and ocean beneath on a distant moon is usually reserved for the realm of science fiction. But this is real and happening as we speak. It's just that it's happening very, very slowly. One might even say at a glacial pace. Thanks for your incredible contribution to the paper, Noah. I hope other scientists seek out your expertise to help them illustrate their research!